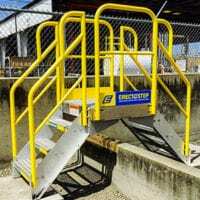 Marine dock self-adjusting stairs (SAS) telescopic gangway. Quality equipment, reasonable pricing, and great service. Our customers waited til the last minute, but there were no issues going this route with SafeRack. When we contacted SafeRack, we were called back the same day, if not the next morning, and we were able to talk to someone that really knew the product. 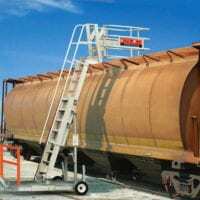 With SafeRack I feel that we will be able to find quality equipment, reasonable pricing, and great service.